Ramo Samee was a 19th Century juggler and magician who starred with his own juggling troupe. In fact, he is considered to be the first "modern" professional juggler, and was by far the most famous juggler in his time. Though Samee performed mainly in Europe from about 1810 to 1844, he did make a tour of the United States in 1819. Samee received a lot of press at the time, both for his impressive juggling skills and for his dramatic all-white costuming, complete with flowing robes and turban (as he was billed as "The East Indian Juggler"). Samee was, in fact, from India, where juggling skills had been a street entertainment for centuries. In Europe, "juggler" was actually another name for "magician". Though it was not until the 1890's that "juggler" came to mean what we think of today, Samee was definitely a "juggler", and a great one. In the early 1810's, Sammee was performing a trick he called "Stringing Beads With the Mouth", in which he "swallowed" a handful of beads and a string, then pulled the beads out of his mouth, one by one, tied to the string. 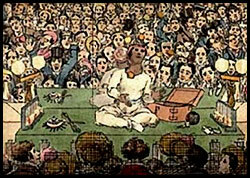 Samee's troupe included Kia Khan Khruse, the juggler-magician who first introduced the "Needle Swallowing Trick" to European audiences in 1818. Obviously, this was a more dangerous version of Samee's bead swallowing trick. Samee was also a sword-swallower and a fire-eater. In his fire act, he would light a piece of rope, place it on a plate, and proceed to "eat" it as a meal. He called it his "light dinner". Though he was the most successful juggler of his era, that did not mean much financially. When he died, he was broke, and his wife was forced to advertise for financial assistance to pay for his burial expenses.